As the delegation from the 2014 Content in Context conference slowly made their way through the busy Washington DC traffic, they passed by a number of important political buildings. They nearly all adhered to a similarly uninviting and almost intimidating design template; stone or brick facades surrounded by high railed black fences, a closed shut, fortified front door watched dutifully by a guard. It was to the great surprise of many of the conference delegates then when they arrived at the Irish embassy and saw a building that somehow managed to manifest the same welcoming feeling that the Irish people are famous for. As they approached the gaping front door, live traditional Irish music lured guests inside and up an elegant spiral staircase. At the top guests were greeted by an abundance of food and drinks as well as an environment that made them feel that they were at home and not in a setting more accustomed to hosting political dignitaries. The most Irish of welcomes. Céad Míle fáilte. Learnosity was delighted to have this opportunity to host the opening reception of the Association of American Publishers Pre K-12 Learning Group Content in Context conference. It was with great honour and gratitude that Learnosity was able to do so in the Irish embassy and in the presence of the Irish Ambassador to the USA. There is a long standing, important relationship between Ireland and the USA. It is a relationship that goes far beyond history and politics and has influenced everything from culture to economics and even education. For Learnosity this setting provided an ideal opportunity to not only launch the conference, but to announce the establishment of the company’s first US office in New York City. Through this office we want to highlight our commitment to the US market and to help better understand our clients’ needs with regard to common core TEI requirements, the trends affecting publishers and the use of technology in the classroom. Learnosity hopes that through this office we will be able to introduce our assessment toolkit to a wider array of K-12 publishers and testing companies and build relationships as strong as the one between Ireland and the USA. Once again Learnosity would like to thank everyone at the Irish Embassy, Enterprise Ireland and the Content in Context conference for helping to make the night memorable. 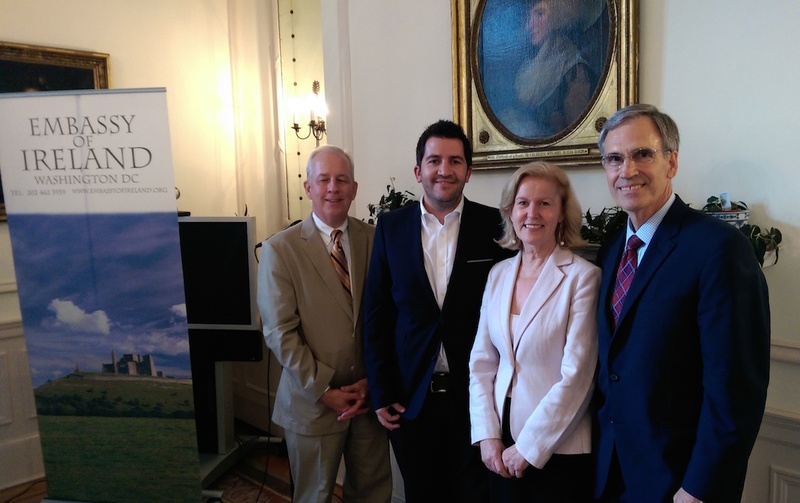 From left to right; Jay Diskay, Executive Director of the AAP’s PreK–12 Learning Group; Gavin Cooney, CEO Learnosity; Anne Anderson, Irish Ambassador to the U.S.; and Tom Allen, President & CEO of AAP.